Prepare for the Upcoming Bleacher Creature Double Feature of a Lifetime! First up: Pope Derby 2013! American exceptionalism: Cooperate with the U.S. or be eliminated. Thoughts on the Way Out of a Certain Door…. The ones that are had better make that one bit good, eh? Today’s Iraq is a direct consequence of our war, our invasion, our occupation. That’s our crowd in Baghdad, cozying up to Iran. And the cost of that war to strip Iraq of weapons it did not have? Four thousand five hundred American dead, 35,000 wounded, $1 trillion and 100,000 Iraqi dead. Half a million widows and orphans. A centuries-old Christian community ravaged. And, yes, an Iraq tilting to Iran and descending into sectarian, civil and ethnic war. A disaster of epochal proportions. But that disaster was not the doing of Barack Obama, but of people of the same semi-hysterical mindset as [Jennifer] Rubin. Sincerely, Pat ‘homophobic, racist, sexist, terminally-constipated Holocaust denier’ Buchanan. Beware of people trying to get you to ignore history. They’re trying to sell you something – and its probably not something you need or want. As an analyst, historical data is often important because it helps answer the question, “How did we get here?” However, this eventually becomes less important than determining “where are we going, and how do we get there?” This is exactly the mindset of most LGBT millennials when it comes to civil rights and advocacy. Unfortunately, some transgender leaders keep trying to revive old grievances, like 18-year-old articles from The New York Times. However, people like Jim Fouratt haven’t been relevant in decades. Janice Raymond and her ilk are a poorly regarded footnote in the annals of second-wave lesbian feminism. Things cited as proof that LGB leadership has it in for the transgender community may or may not have actually been said. Barney Frank has retired. So has Joe Solmonese. The historical reasons typically cited for the division between the LGB and T have become just that: history. A sleight of hand is worth a Huff(Po) of paint in a paper bag behind the bush. Despite the seeming doff of the hat to history, with this demand Brynn Tannehill is trying to sell you something that we don’t need: amnesia. We were told that the past was the past in 2007…. and then the text cuts off. I didn’t see this text at HuffPo when I looked at the piece online, and even if its not part of the piece, the scenario matters. Brynn, as long as we live with laws manufactured with the help of various strands of Gay, Inc. and which distinguish between the covered (LGB) and the not-worthy-of-being-covered (the T) in places like Wisconsin, Maryland, Delaware, New Hampshire, New York and (because lack of public accommodations means that the law that was passed is meaningless) Massachusetts – and, lets face it Brynn, if the recently-retired bobsey twins that you don’t want us to think about any longer (yet who are probably slithering around the halls of Congress in one capacity or another whispering in people’s ears) had gotten ther way 5 1/2 years ago, we’d be including all of the United States here and we’d be still including it because the sort of amnesia that you’re demanding is the conjoined mental fistula of an inability (unwillingness?) 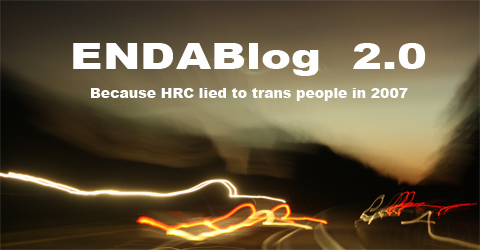 to visualize what would have happened on the ENDA front after St. Barney and Pee Wee managed to get the HRC version of ENDA enacted in 2007, which is NOTHING – then your demand is no less offensive than the catholic church’s demands that victims of its institutionalized mass child molestation scheme forget about the past and just move on. Joe Ratzinger d/b/a/ Pope Benedict XVI will be retired as of Friday. I guess he’ll then begin to be worthy of getting a pass on his past as child-molester-shielder-in-chief, eh Brynn? If he makes it to summer, he’ll then be retired longer than St. Barney is now. Will he get a pass then? Or, in the case of that trans man, just get assaulted – and have our cases attended to by the powers that be – separately. Decades ago, the Iowa Legislature passed a hate crimes law – one that included sexual orientation. The definition for “sexual orientation” is identical to one preferred by one of Iowa’s neighboring states. Yes, in 2007, a different bunch of Iowa legislators passed a legitimate employment anti-discrimination law but, for whatever reason, didn’t update the hate crime law. Maybe they channeled Brynn Tannehill from the then-future and thought that, given that the hate crime law was by then almost two decades old it would be just so gauche to even think about it. The past is the past after all, no? In Iowa, if the trans man was classified as a trans man, then the assault could not be charged as a hate crime, but if he was de-gendered and classified as a lesbian then it could be. The past isn’t just the past; its the present. and they’ll never see any of it coming.